If you had never been diving, you might assume that islands float. Then you might learn that islands are, in fact, just mountains poking up from the sea floor. And you would be told that islands don't float. So what if you then found yourself on a floating island? Would you even recognize it as an island? What if you learned to recognize life by our current earthly definitions, and then you went exploring on some distant planet and came home empty-handed, only because you were unable to recognize life in a different form? What if you lost your beloved baby - the one who was real to you, even though your parents kept telling you it was plastic - and you cried every night and found no joy in your days for months, and nobody understood your pain because your definition of 'real' was not in their dictionary? Then what if you pinned all your hopes for finding your beloved lost baby on Santa Claus, and you wrote him a letter, but they told you Santa Claus couldn't find your baby, and sometimes real life just hurts, and then your Auntie and Nana colluded to replace your baby as a Christmas present from Nana, and she wasn't the same baby, and you gave her a new name, and the hole in your heart wasn't filled but you felt joy again, and you discovered that Santa Claus is real, and that Nana and Auntie are a part of him, and you lost a little faith in the world, but you gained a little, too? And what if you spent the rest of your life searching for answers and discovering all sorts of new ways of looking at things, because somebody let you make your own definitions instead of boxing you into their own? 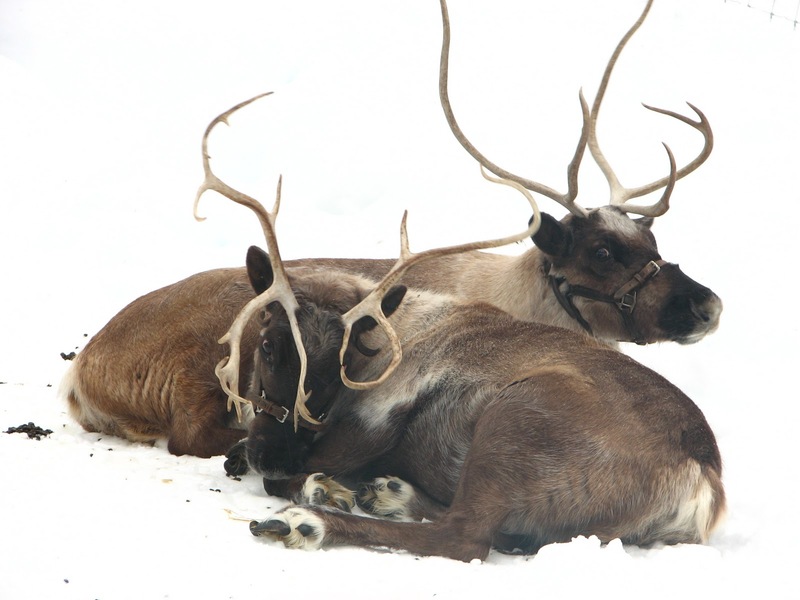 These are the caribou that my daughter saw on Grouse Mountain. They were supposedly Santa's reindeer, and I told her that Grouse Mountain just wanted to attract more visitors by pretending they were Santa's reindeer. She went into the little hut there to visit the man dressed as Santa, and told me afterwards that she knew he was the real Santa because he was so nice to her, and he loved his wife, Jessica. And because Jessica was friendly, too. I told her maybe they were just nice people. It was shortly after this that she wrote a letter to Santa asking him to help her find her missing baby. To Santa and Jessica, and the two bored caribou on Grouse Mountain, thank you for giving my daughter hope. Some people think science is about definitions and categories; rules and laws and putting things into boxes. I think it's about breaking open all the boxes. Science is about opening our minds. So what about "magical thinking"? I've been told many times that magical thinking harms our children, either because it sets them up for a huge disappointment, or because it leads them to believe things that are just not true. In allowing them to believe in things we have no empirical evidence of, we are lying to our children; leading them into a life of blind compliance. Further, magical thinking allows us to be taken advantage of due to the inherent innocence and vulnerability of belief in unproven ideas. Nobody wants that for their children. But I believe that a lack of magical thinking does the same. It hobbles us to the chain of somebody else's empirical evidence or, even worse, as scientists it closes our minds and limits us to the ideas of our predecessors, unable to make advancements or explore new possibilities. We've probably all heard Arthur C. Clarke's statement that "Any sufficiently advanced technology is indistinguishable from magic", and many renowned scientists who were once considered lunatics have experience with that. Of course many theories are eventually proven false, just as many supposed facts are also eventually proven false, and then many falsehoods are eventually discovered to be true. How can we navigate this confusing landscape of understanding with our minds firmly latched onto empirical evidence? We need a broad imagination and acceptance of our own lack of knowledge to learn anything at all. The Critical Thinking Association states that 'magical thinking is the opposite of logical thinking'. I feel, in fact, that they are inextricably linked. Reason allows us to consider all alternatives for a given question and to choose those potential solutions that merit more exploration. Logical and critical thinking give us the tools to explore those ideas. Without any faith in the plausibility of those ideas, what reason do we have to explore them? I've been exploring the idea of Santa Claus with my children since my son was three. That's when he told me that Santa Claus was coming. Not wanting to shatter his little heart too quickly, I asked him why he thought so. Apparently he "just knew". I told him that Santa Claus had never visited me (or him, for that matter), so I doubted that he would begin, then. I said I wasn't even sure Santa was real, and if he existed at all, he surely wasn't sitting in every mall in the country, and my son agreed. But some of those men might be very very kind and wanting to make children happy, so doesn't that mean they're doing Santa's work? Maybe. But what if there's no real Santa? I told him that the North Pole is nothing but water and ice, and he replied that there must be something at the bottom of the sea, or that people could live in the ice. And I thought, Who am I to tell him that's impossible? So I didn't. And Santa came. Because it's not my place to determine for my son what's real and not real, or to define the idea of Santa Claus based on my own upbringing or the popular standards. That year there were things in the stockings from me, and some from Santa. I don't want to lie to my children, so I tell them the truth, which is that I don't know. In the abstract from his research paper, Magical Thinking and Children's Cognitive Development, Eugene Subbotsky states that "...despite the fact that multinational industries (such as toy production and entertainment) exploit and support magical beliefs in children and many TV programs for children show magical characters, surprisingly little is known about the effects of magical thinking and magical beliefs on children's cognitive and social development. Is involvement in magical thinking confined to the department of entertainment, or has it also to do with more practical aspects of children's lives, such as learning and social communication? It is hypothesized that magical thinking does indeed positively affect children's cognitive development, by enhancing creative divergent thinking in children." So what kind of world do we want to live in? A world where everything is untrue until proven true, or a world full of possibility, exploration and growth? I never believed in Santa Claus because I thought he was impossible. Now, as I explore the many aspects of him with my growing children, I am open to the possibility of him. I also partake of his magic, by participating. I and my children absolutely adore our sneaky little stocking-filling expeditions in the night, and we are all a part of Santa Claus. That joy is one of the gifts of keeping possibility open. Another is the knowledge that my children's minds are open, too.